Ask my husband and he will readily tell you that my favorite condiment might just be pesto. I seldom make it, but I love it on sandwiches, in soups, as pasta sauces. No doubt amazing goodness from the oil, basil, and pine nuts. So simple yet completely flavorable! I started with a recipe from Tracy over at Shutterbean (I love her photography and her recipes, so go check her out if you haven’t). I knew I had some pesto in the fridge that I needed to use and I know my husband loves soups but needs protein to make it more filling. That is how I made the soup my own. Cook onions, garlic, and turkey together until done. Let drain. Add the seasonings, broth, pesto, chickpeas and bring to a simmer. Add back in the turkey and onions and garlic. Add the tortellini and cook until done. Then at the very end add your spinach. Serve with croutons, toasted bread, or parmesan cheese (or all three). I know this soup is good. I made one a couple of days ago and I was working on a post today for it. The ingredients are very similar. My 17 year old son said this was the best soup he had ever had. This is saying a lot because he is my meat and potatoes man. He normally does not prefer soups. 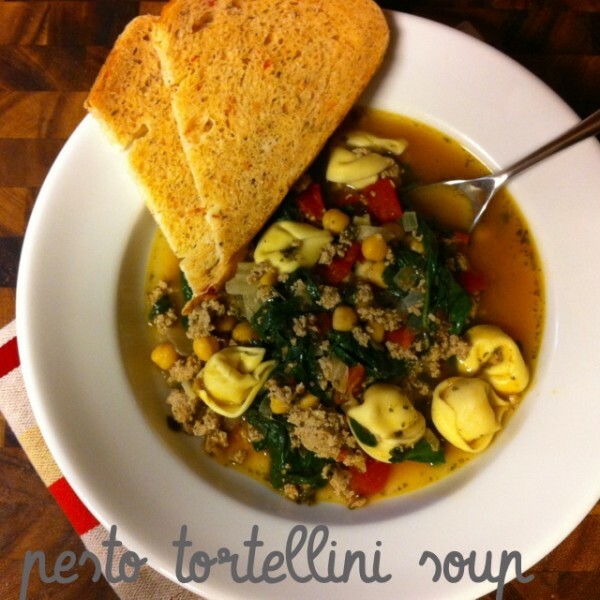 Thank you so much for linking up this delicious soup recipe. I really appreciate your support.